Have you heard about Kakao Talk? For me and Koreans Kakao Talk is an inextricable mobile communication app today. Kakao Talk is an application for smartphones which allow people to have instant mobile chatting without having barriers of time and space. If there is wifi connection with your smartphones, you can have message chatting, voice chatting, video chatting and sending various types of files (e.g. photos) in your chatting rooms. Kakao Talk is similar to WhatsApp , but Kakao Talk has more functions than WhatsApp. For example, Kakao Talk has Kakao Shop (buy gifticon), Kakao Pay, Kakao Style, Kakao TV, Kakao Taxi (you can call taxi through your Kakao Talk app whenever you need to take a taxi) and etc. Various brands of ice cream shops you can choose and send gifticon through using Kakao Talk to your friends or family. Gifticon has a diverse selection to choose from such as a range of clothes, accessories, foods, e-coupons for cafes or restaurants etc. People who receive gifticon from their friends through Kakao Talk, can simply show the e-code of those gifticon to the counter of the shops when they want to use them. Kakao Talk is a one of apps for mobile communication on smartphones. Kakao talk allows people to have constant mobile communication whenever they need and wherever they want to communicate with their contacts. It becomes a huge mobile communicative tool for Koreans. Group chat rooms are good example to explain how Kakao talk became a major mobile communicative application for Koreans. For example, companies have mobile meetings on their group chat rooms, family discusses their next meeting on their group chat rooms and especially ajummas love group chat rooms! Through using group chat rooms in Kakao Talk, people can do ‘group chatting’ with their friends or colleagues easily. They don’t have to send the same messages to each person one by one. Yes, Kakao Talk’s group chat room is so convenient to organise meetings with friends. All I need to do is just create a group chat room. And then it is very easy to send a message to everyone at once! It’s so easy! According to the interview above, the main reason to use group chat room of Kakao Talk was for sending messages to several friends at once and organising meetings as well. As it is easier to send the messages to everyone who are in the same group chat room, it is convenient to organise meetings without hassle rather than send the same messages to each person separately. Besides, people in the group chat room can discuss or manage together to set a place and time for a meeting with ease. This means that, everyone can see the content of conversation at one view and even though they might miss the conversation, people can come back to read those conversations at any time with their smartphones. The advantages of using Kakao Talk’s group chat room attracts ajummas who used to call to each friend to organise the regular meetings. The beginning of every month, my mom’s smartphone gets busy because of Kakao Talk’s alarming sound. Her friends send Kakao Talk messages endlessly to organise their regular meeting. My mom wasn’t familiar with using her smartphone and Kakao Talk before. But now she is an expert of Kakao Talk! She purchased another cute emoticon for Kakao Talk few days ago. She told me that her friends got so many emoticons so my mom also want to buy another new released emoticon to send her friends in the group chat room. How cute she is! And how cute our ajummas are! I did focus group interview with 10 ajummas from 2014 to 2015. I asked them ‘How has your life been changed after using smartphones?’ And here are answers of ajummas (aged mid-50 to mid-60). The photos are not related to the interviewees at all. 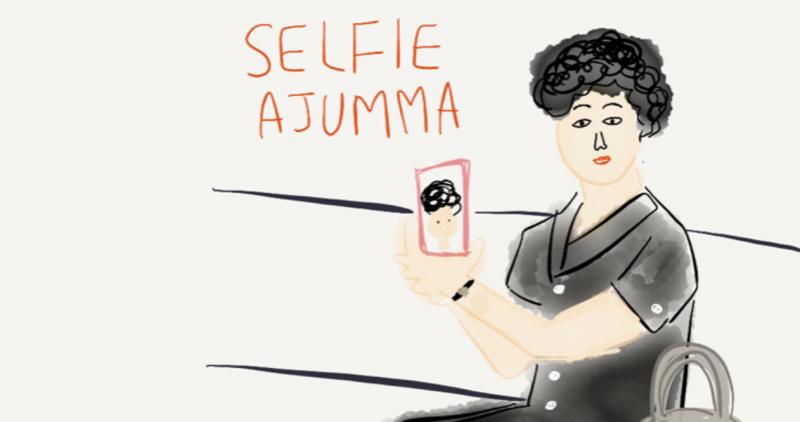 I took photos of ajummas on the street randomly. The findings from focus group interview with smart ajummas will be continued via this blog. Thank you.